This module lets the user a possibility to introduce into a mechanical system deformable bodies, which are undergone large reference displacement but small deformation. 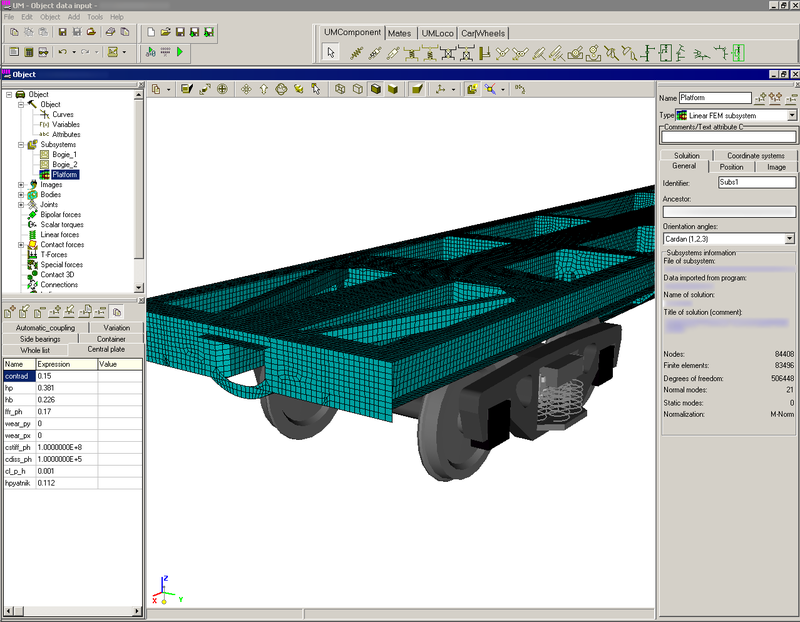 Such an approach makes more exact results in comparison with the multibody simulation. For example the module is useful for the analysis of vibration of car body and bogie frame during the motion of a railway vehicle subject to the influence of railway track irregularities and power generating set. Such models are usually called hybrid. Flexible bodies are introduced into the UM model with the help of the subsystem technique. Every such a body is presented in the model as a separate subsystem and included into the model on the stage of its description. Flexible bodies can interact with other subsystems of the model including flexible ones by means of joints and force elements of any kind. This approach requires preliminary stage of analysis, which includes modal analysis of a finite-elements model of the body. The module supports import of results of modal analysis from ANSYS, NASTRAN. All kind of tools, which are available for rigid body simulation, are supported by UM core for flexible bodies too. They are online animation during the simulation; coordinates, velocities and acceleration of nodes; reaction forces, etc. optional switching-off flexible properties of bodies and treating the flexible bodies as rigid ones.